There has been an explosion in the Jewish music world with more songs being produced than ever, and it is often hard to find one album that, in its entirety, has a great song one after the other. With the combination of talent, songs, musicians and arrangers, this album has the potential to be the best complete album in recent years. Shout to Sruly Myer for all his tireless efforts in helping this project come to fruition! I encourage you to purchase this album! Toda: There are some songs that take time to enjoy and there are songs that are instant classics. When I first started playing Toda, I knew this would be a winner. It is an energetic hora with an incredibly deep and powerful message. This song is comprised primarily of made up lyrics and written by Sruly Green. Additionally, the listener will enjoy a nice set of English lyrics with 8th day influence. Im Ein Ani Li: It is always a challenge to take an old song and successfully bring it to the fore with grade A quality. Along with Benny’s vocals, the arrangements of this song are particularly poignant. This is a classic Israeli rock song that everyone can enjoy and is sure to create tremendous energy! I personally kept putting this track on repeat! Ribono Shel Olam: The tefillah for the Shalosh Regalim is a beautiful supplication in its own right (even without song). This song brings out the emotion in the words as Benny sings and makes his own. This is a heartfelt plea to the Ribono Shel Olam as a beautiful ballad. Of course, it does not hurt that the composer of this song was Yitzy Waldner with arrangements by the one and only Leib Yaakov Rigler! What a dynamic team of professionals! Fulfill Your Tefillah: Typically, I am not the biggest proponent of songs with English lyrics. However, this song is fun to listen to, and has so much depth in the words written by Shua Bitton and Eli Friedman. The message of this song is that we – Am Yisrael – need to daven with all our heart and the Ribono Shel Olam will answer our tefillah and fulfill our needs! I particularly enjoy the a Capella portion of the song. Kol Haneshama: This song is composed by Shmuel Marcus, and you can tell. This song has 8th day written all over it. The Marcus brothers, aka 8th day sing along with Benny in this incredibly upbeat song. The arrangement has a latin-style overtone. When you have a family as talented as this one, there is no limit to the creativeness that they can bring to the Jewish music world! L’Hisaneg: This song is written by Ari Goldwag and arranged by Naftali Schnitzler. When Benny and Ari collaborate we benefit. This song I describe as classy. I have, for the longest time been thinking that we need a new L’hisaneig to sing at our Shabbos table. This song is that song. This song is easy and pleasant to sing and teach your children! In fact, this song features the MK children’s choir and it adds such an elegant element to the song! Bum Bum: I know, the title sounds pretty bummy right? This song is composed by Ari Goldwag and Elimelech Blumstein with background vocals by Yitzy Spinner! This song has a bandstand feel. It is fun and easy to catch on to. Avi Singolda is on many tracks on this album, but you have to pay attention to his guitar on this track! After listening to this song, I have no doubt you will find yourself humming “bum bum bum asher bum bum bum”. Hamalach: This song is written by none other than Baruch Levine and arranged by Tzvi Blumenfeld. 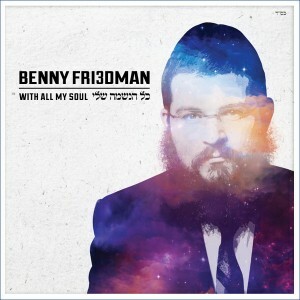 This is a gentle night time ballad similar to B’sheim Hashem from Benny’s last album. In this track, again, there is a full string and horn section giving this song so much richness to it. This is a beautiful and relaxing song and is pleasant listening! Yesoid V’Shoresh: This song is composed by Pinky Weber and arranged by Naftali Schnitzler. The words of this song are taken from likutei of Tanya. Essa Einai: This song features Shlomo Simcha, Tzvi Blumenfeld of the Yedidim choir, and is arranged by Naftali Schnitzler. This song was written by Rivky Brachfeld who dedicated this song in memory of her grandfather. This song possesses a lot of emotion and the combination of Benny and Shlomo’s rich sounds make this song a masterpiece. Rak Beyachad: This song is composed by Eli Klein and arranged by Eli and Yitzi Beri. Featuring the Shira B’Simcha choir. This is a freilach with its focus on the words rak b’yachad. With the message being “together-ness” this should become an instant wedding hit! For the record, Fulfill Your Tefilah was composed and lyrics written by Shua Bitton. Additional lyrics were added by Rabbi Eli Friedman with help from Shmuel Marcus. But the song concept, composition and words are all Shua!